It's no surprise that the ocean is filled with majestic, mysterious, and occasionally terrifying specimens, but you don't generally expect to find yourself face-to-face with any of them unless you're out in the open water or gawking at them through an aquarium tank's glass. That's why it must have been quite a bit startling for a trio of siblings in New Zealand, when they stumbled upon a monster giant squid on the beach while searching for a spot to go diving. Brothers Daniel, Jack, and Matthew Aplin were recently driving along the coast in Wellington, New Zealand, looking for a good place to suit up and go for a dive together, when they spotted the freakishly huge cephalopod washed ashore, according to a report from news.com.au. The three men were struck by its size, and decided to get a closer look. "My brother said 'what's that over there?' and pointed it out," Daniel told the radio station Newstalk ZB in an interview. "It was right next to the track so we pulled over and we were like: 'It's a big squid'." It was big indeed, measuring nearly 14 feet-long, or about as long as two and a half queen mattresses. Naturally, the guys decided to pose for a couple pics with it. Rather than throw an impromptu calamari party, the brothers contacted the National Institute of Water and Atmospheric Research, who said they would come to collect it to presumably try to determine why it died. Not quite as big as "colossal squid," giant squid are objectively huge, and have been known to grow as long 40 feet, though they typically spend their time in the deep sea and are rarely seen. However, it's apparently not uncommon to find them washing ashore in New Zealand. Two others have been spotted there in the last five years including a 23-footer that was found on a beach in Kaikoura back in 2015, according to EarthTouchNews. 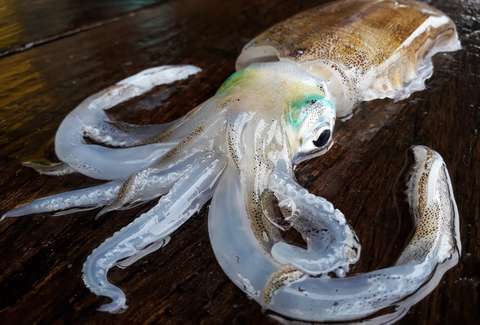 While squid do have beaks that they use to attack and eat prey, they don't generally pose a threat to humans since they lurk mostly in incredibly deep, remote waters. So, uh, just try not to think about that the next time you swim out past where your feet can touch.